I like it when companies put a little more care into the design and build of products. Toshiba’s Kira (a Japanese word meaning ‘shining light’) ultrabook computer is one such device, and at this morning’s Australian 2013 launch of consumer computers it was star of the show. The first thing you notice about the Toshiba Kira is that it is very thin, and very light. The case is made from magnesium alloy, with a chassis employing ac honeycomb structure for both strength and weight reduction. Open it up and switch it on, and you’ll see the 13.3-inch “ultra-high resolution PixelPure display”. It is a lovely, easy-to-read screen, protected by a Corning Concore glass, and yes, it is a touchscreen display to make use of the busy beast that is the Windows 8 operating system. As mentioned in the opening, design is front and centre with the Toshiba Kira. Indeed, all the Toshiba range of consumer tech items will now sport a unified look. The Managing Director of Toshiba Australia, Mark Whittard, said that Toshiba is an engineering company, not a design company, and that the design of the new range was carried out by an unnamed big name design consultancy firm. Other specs include: 3rd generation Intel Core processors, 256GB Solid State Drive, 8GB 1600 MHz memory, and pre-loaded Adobe Photoshop Elements 11 and Premiere Elements 11 software. Battery life is given as “up to 6 hours”. Now, to the tricky bit. In the launch Dell’s failed premium brand ‘Adamo’ was mentioned. That too was a grab for the design-conscious purchaser, that, for a number of reasons, did not succeed. One such reason could well have been the price, and it is at this aspect that I think the Kira will have its biggest battle. 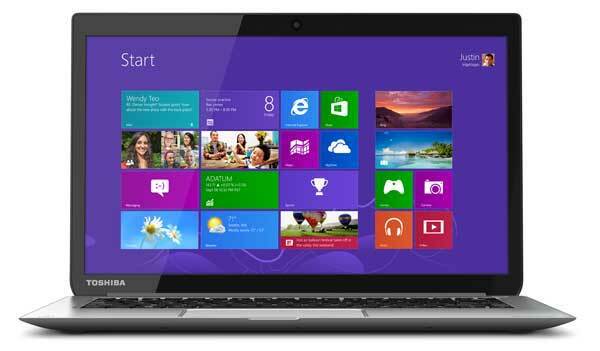 Three versions of the Toshiba Kira will be available, using either the Intel Core i5 or Core i7 processors. The price range for the three versions is from $1,799 to $2,199 RRP. Two year manufacturer’s express warranty service with on-site metro, courier pickup/return in regional locations. Two year Hotline support service – during normal business hours. It should also be noted that the dreaded words “conditions apply” accompany the warranty and service details. At the time of writing the Toshiba Kira is in trucks on the way to Australian retailers, and will go on sale next week. Click the thumbnails below to view larger images of the Toshiba Kira. Previous ArticleLG Curved OLED TV – Ewan McGregor swears by it!